About a week ago, Turkish Jews invited about 200 Muslims to break the Ramadan fast at the main synagogue in Istanbul. The response was overwhelming, and even Istanbul Mayor Kadir Topbas, a supporter of the Jews, was present at the event. "I have many Jewish friends even back from my studies," he said to those present. "The recent events are not only difficult for Israel, but also for us Turks. I ask of you to tell the Israelis to return to our country. It is a mistake to think that the Turks will not accept the Israelis with cordiality." Topbas' warm words on Turkish Jewry's contributions to his country did not mitigate the concerns of the Jews present. "We all live in fear," said one of them in the presence of the distinguished guest. "The street is affected by what happens in politics, and we are on the brink of desperation from life here. We love Turkey, but will not be able to live so long in fear." There are currently 17,000 Jews living in Turkey. Most of them live in Istanbul and Ankara, with smaller concentrations in Izmir, Adana, Bursa, and a number other smaller cities. The Marmara raid, which prompted many Turks to take to the streets, did not leave the Jews many options. "The situation has not calmed down, but has only gotten worse. The Jews feel isolated," one participant expressed a sentiment shared by many Jews in the community. The Jewish Agency and the Israeli government have tried for decades to convince the Jews of Turkey to move to Israel. However, they felt safe in Turkey and few immigrated. Ever since the flotilla incident and the anti-Israeli statements made by Turkish Prime Minister Recep Tayyip Erdogan, however, the situation has changed. 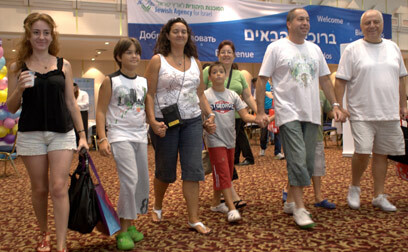 "Eighty-five Jews immigrated in the first half of this year," said Jack Aboursi, chairman of the Organization for Turkish Immigrants in Israel. "Turkey has already become a country in which it is not good to live as a Jew. There is anti-Semitism, and the street is very affected by the prime minister's inflammatory statements. I used to visit Turkey a few times a year, but it has been two years since I have visited. Nor do I see myself visiting." Refael Saadi, 55, one of Erdogan's classmates, is also hurt by the situation. "Most of the Jews of Turkey made a living in textile. But recently there is a feeling that they are trying to take the textile industry from the Jews. The Turks decided to damage Jews' incomes so they would flee. "There has been a large emigration wave in recent years. If about 100 people would typically move to Israel every year, the wave has increased and many more are looking into the option of making aliyah. I told Erdogan there is anti-Semitism in his country, but he rejected my remarks claiming they are empty words. Despite his denial, the Jews feel horrible." Nissim Yochai, 54, a successful textile businessman, immigrated to Israel on Friday with his wife and son. "It's a scary situation," he said. "I think that in another five years, there won't be any Jews remaining in Turkey. It is a community in serious distress, not just politically, but economically as well. Most of the Muslims tend not to buy from Jewish shops, especially in textiles. "In the period when Israelis were coming to Turkey en masse, we had buyers, and we felt very safe. We spoke a little bit of Hebrew, and we heard from them about experiences in Israel. Now, they also have decided not to come, and we are left by ourselves. Turkey is moving towards Iran. Therefore, most of the community wants to get out before it's too late." Yochai's decision to make aliyah was not finalized because of the flotilla raid. Instead, it was most affected by the highly publicized spat between Erdogan and President Shimon Peres over Operation Cast Lead. Erdogan walked out on Peres during a debate in Davos as he hurled blame at Peres. "Most of the community understood then for the first time where the prime minister plans on taking Turkey," he said. Tildah Mizrahi, 27, also a new immigrant, immigrated on her own. "I want to live in Israel and feel safe," she said. "I had concerns about immigrating, but they have already faded. In any case, I left a family and a loving home, and I came to a new country to learn a new language. But I'm happy and am certain that within a short time I will find myself speaking Hebrew and contributing to the State of Israel and the State of Israel contributing to me." The Jewish Agency would be happy if articles such as this one were not published. "We don't want to cause problems for the Jews. It is best that such articles were not published in the Israeli press. It simply makes problems for the Jews with the authorities," said a senior official in the organization. Hagit Hilleli, the Jewish Agency's media spokesperson, said, "The Jewish Agency does not address the Turkish aliyah figures or the flotilla incident. There is no persecution of Jews in Turkey. Immigrants come to Israel because they wish to build their homes here." See all talkbacks "Immigrating out of fear"